As a school director one of the biggest challenges I encounter is searching for ways to help teachers prepare and create a proper environment for their students. While working at my office I can hear children crying either because they have difficulties understanding and grasping the idea that THIS is their new place, our “children’s house” as Maria Montessori called it, or they are crying just because they are having a bad day. It is then that I start looking for solutions, and “The Peace Table” comes to my mind. This is the place that will enable children to: take a break whenever they feel like having one, have a conversation with a child helping him/her find a way to apologize to a friend if he/she hurt someone’s feeling. Yesterday one of our little students had a hard time adjusting to class so one of the teachers just offered her to take a break and go and sit at the Peace Table. She did, she played with the objects on it, and when feeling more relaxed and ready she returned to class. She was asked to do the Metal Insets lesson and she actually finished the whole booklet. 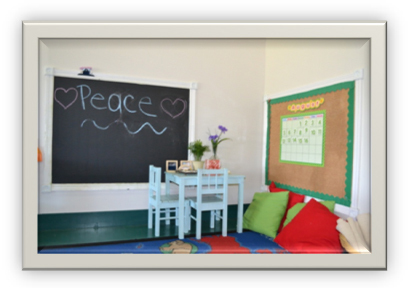 The Peace table is not only a tool to help kids concentrate, it can also help children to talk about things that bother them, it is a safe place for them, a place that will give them peace, a place to retreat when they child feels he/she needs. in work gives us reason to hope that humanity can develop in a new direction.